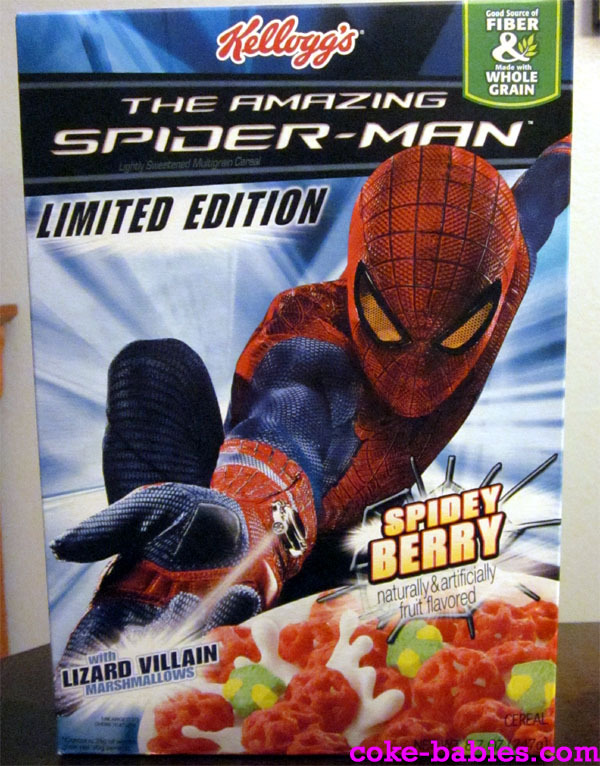 Cereal Review: The Amazing Spider-Man Cereal – Plus Bonus Licensed Cereal History! Licensed cereals have been around since the dawn of time. Don’t bother confirming that – it’s true. However, they really became popular in February of 1982, give or take a few months / years. When starting this article, I had been thinking that C-3PO’s started the licensed cereal trend. But when fact checking when C-3PO’s came out (don’t get used to the fact checking, by the way), it turns out they weren’t made until 1984. This is how hot the Star Wars trend still was – they could get away with one of the most boring licensed cereals ever. They were just Alpha-Bits shaped like, the number eight, I think? What was that shape intended to be? This is actually the first time I’ve ever thought about it, and am starting to think maybe the shape was meant to be a C-3 smushed together. In which case… that’s stupid. It would be one thing if his (its) nickname was C-3, but it wasn’t. 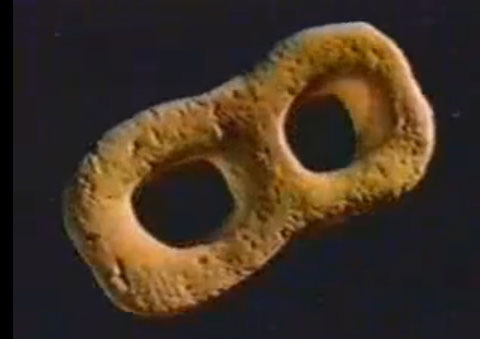 They were just too lazy to figure out how to make a machine that could produce cereal pieces shaped like “Threepio”. After finding out C-3PO’s cereal wasn’t made until 1984, I tried thinking of others that could have come earlier. My best guess (I had long since stopped fact checking, by the way – I warned you) was E.T. Cereal. E.T. Cereal, by the way, sounded awesome; but I don’t recall ever eating it. But chocolate and peanut butter pieces is a pretty legitimate flavor combo; the fact that they couldn’t truly tie it into Reese’s Pieces was a shame. Then I realized I actually have no idea when E.T. the movie came out, let alone the cereal. It was around this point that I realized that my knowledge that something came out “in the 80’s” wasn’t going to be precise enough. So I basically gave up on the history of licensed cereals. Besides, it’s been done plenty of times by people who probably, you know, did some research. Or at least looked on the internet for pictures. Wait, Gremlins! I know there was a Gremlins cereal. Didn’t that movie come out before 1984? I apologize, the first half of that decade really blends together for me. In fairness, I think my excuse of “being five years old” is pretty legitimate. Point (barely) being, licensed cereals, more often than not, are awesome. Sure, there have been plenty of misses. The worst, of course, being Morning Funnies. 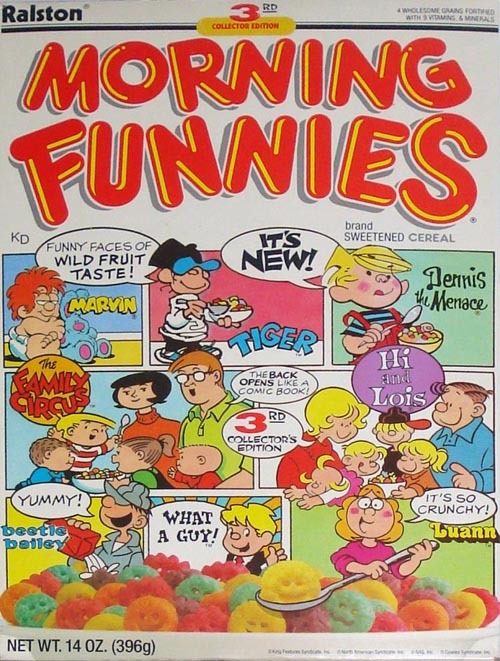 The concept wasn’t bad – a cereal based around characters from comic strips, where the back of the box actually opens up to reveal more comic strips. The problem was, the characters were terrible. Family Circus, Luann, Marvin (who? )… I would continue, but leading off with “Family Circus” is more that enough evidence. Making matters worse was that the cereal itself was awful. The pieces looked like Giggles cookies, except in neon colors. 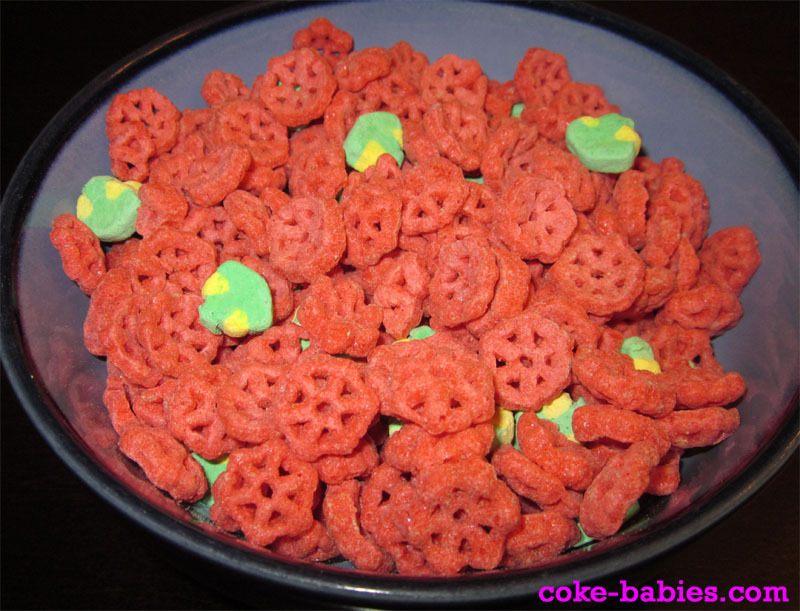 They tasted like Froot Loops if you removed the artificial fruit / froot flavors, and only left the flavor of “sugar”. The occasional swing and a miss aside, licensed cereals have had a long history of successful attempts. 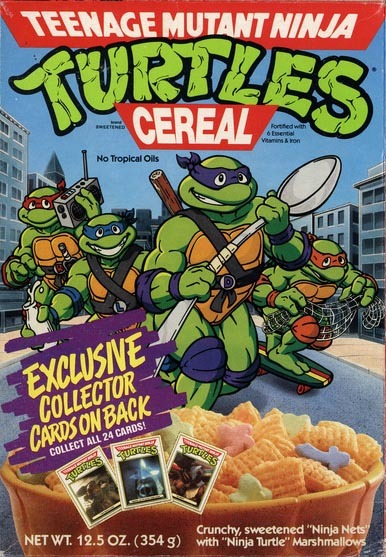 The greatest licensed cereal ever being Teenage Mutant Ninja Turtles Cereal. This cereal had everything going for it. Ralston (of course it was made by Ralston) could have rested on the TMNT laurels. TMNT could do no wrong at the time, even food wise. Lest we forget the glory days that were when you could just go into a deli and by a Turtle Pie. But no, they weren’t going to make a generic cereal. Well, I mean they sort of did, but it was at least somewhat different, and more importantly – good. The cereal itself was awesome – basically sweetened corn Chex with Lucky Charms marshmallows. However, they didn’t stop there. Some of the boxes came with a Ninja Turtle shaped bowl – right on the box. No “send in 10 proofs of purchase” nonsense. It was shrink wrapped right to the box! The cereal was so popular, it lasted long enough to promote two different movies. I think, anyway. I just know it was around for a while, and at some point had flip books inside for TMNT:II. I would cut this article off here, since it’s enough for a somewhat lazy history of licensed cereals. If you’re very generous with the term “somewhat”, anyway. But no, you are going to be treated to a genuine review of an honest to goodness new licensed cereal! New to me, anyway – I only saw it in stores recently. But given that the movie came out weeks ago, this cereal review probably is well past the “sneak preview” stage. This is closer to the $2 second-run theater of cereal reviews. 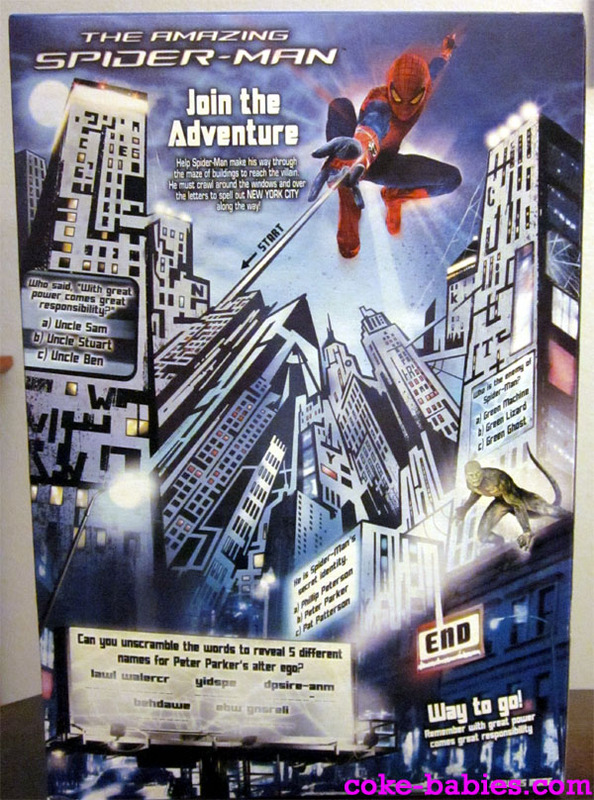 The Amazing Spider-Man cereal clearly knows its licensed cereal history, as the packaging alone borrows from many of the classic licensed cereal traditions. It has a flavor (and marshmallow shape!) lazily shoehorned into the movie’s theme, and has the main character present but not involved with the cereal whatsoever. It even has the extremely fake milk, although it looks too fake to even be the old “use glue instead of milk” trick, which I learned from “Zillions” magazine. The milk actually looks like claymation ghosts. They don’t bother including a prize, instead going for the more lazy “activities” back cover. Among the activities are one of the most complicated-looking mazes I’ve ever seen, and some trivia questions. The trivia questions are odd, since they seem written by someone who hasn’t actually seen this Spider-Man version. 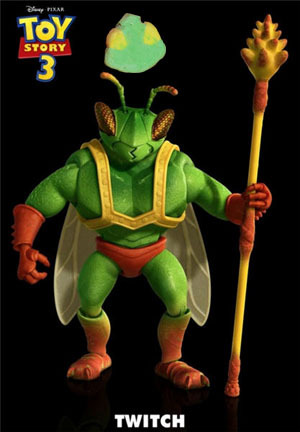 They name the villain as the “Green Lizard” (? ), and ask who said “With great power comes great responsibility”, despite the fact that this classic line (spoiler alert, I guess?) isn’t actually said in the movie. But who really cares about the box? Well, truth be told, me – but beyond that probably not many people. Let’s get to the cereal itself! Opening the box is a promising experience, because as soon as the bag is opened, you are greeted with an extremely powerful Strawberry Quik smell. One rather surprising aspect of the cereal is the shade of the web cereal pieces. Licensed cereals usually go for the ridiculous coloring. But this shade of red is strange and murky – almost maroon. No bright red or pink berry pieces to be found here. One thing that’s impressive about the cereal pieces is their ability to evade picture taking. I tried with three different cameras, and each one resulted in a different color for the cereal pieces – and none of those three colors were the actual color of the cereal. Its color-shifting abilities are almost like that of a chameleon, or… The Chameleon. This is the most meta reference ever in a licensed cereal! As for taste, it’s really good. I would say you could use this to tide yourself over until the fall, when Frankenberry is released. Except the Spider-Man cereal won’t be around for too long, so it isn’t a viable strawberry cereal survival ration. Like any good cereal marshmallow, it adds almost nothing to the cereal-eating experience. While you know the cereal wouldn’t be anywhere near as good without the marshmallows, you could never come close to explaining why. Also, like any good cereal marshmallow, the marshmallows look nothing like The Lizard. Sorry, “The Green Lizard”. They look like little “Agent of Hydra” marshmallows. Actually, what the marshmallows really look like is Twitch from Toy Story 3. The cereal is not without its flaws, however. As part of an extremely distressing trend, like I mentioned when reviewing Krave cereal, The Amazing Spider-Man Cereal does absolutely nothing to the milk. With the strong Strawberry Quik smell, and potent berry taste, I was hoping for some Strawberry Quik-esque milk, or at the very least with some hints of Strawberry Yoo-Hoo. But no. Instead, we are just left with… milk. Kellogg’s refused to coat the cereal pieces in extra berry powder, scientifically designed to immediately wash off into the milk. Why is this such a hard concept to implement? Get this idea fast tracked! The other sort-of weakness is that as good as it tastes, there is this underlying “healthy” taste. God forbid, I know. But the cereal almost falls into this uncanny valley of cereal, where it tastes healthier than the stats show it to be. Not sweet enough to be a glorious kid’s cereal, not nutritionally strong enough to be a grown up’s cereal. At the same time, the nutritional stats are pretty legit – almost identical stats as Honey Nut Cheerios (in fact this has one more gram of fiber per serving). And General Mills is always pushing Honey Nut Cheerios as a healthy sweet cereal. So feel free to classify The Amazing Spider-Man cereal as healthy, as well. Overall, I give this a strong recommendation – Two Non-Organic Because That’s Stupid Mechanical Web Shooters Up! Probably the biggest downside is the disgracefully small amount of cereal you actually get – 8.7 oz. Also, I guess the fact that by the time you read this, the cereal won’t even be on the shelves anymore. But as an attempt to continue in the grand tradition of the licensed cereal, The Amazing Spider-Man lives up to its predecessors’ attempts proudly.